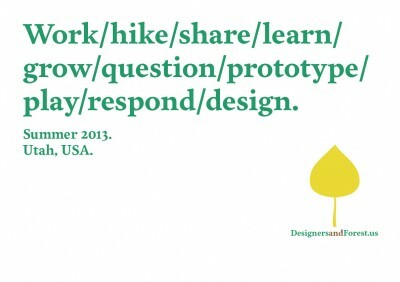 This summer I will participate in Designers & Forest from July 29 – August 10 in Utah, USA. Designers and Forest will initiate a conversation surrounding problems currently facing the Western United States forest and specifically the forests of Utah. Who we are: Designers and Forests is a group of invested and interested individuals from around the world and is growing. The forests of the world are connected through climate, international trade, and governmental policies. Through similar traditions of forestry, agriculture, and craft. We feel that our experiences working with and handling forests should also be connected. The founding members of the group are composed of individuals from the United States, (New York, Utah) and Sweden. We are educators, designers, foresters, scientists, storytellers, community organizers, and students. Who we seek: The project is seeking interested individuals from various backgrounds who wish to join our conversation about forest and community health. We are educators, graphic designers, furniture designers, foresters, and community activists. We seek collaborators, designers, and artisans who are interested in exploring new materials or old materials in new ways. We seek scientists and foresters who can inform and educate about pest, weaknesses, and forest health. We seek community members who are looking for alternative means to traditional economies. We seek storytellers who can share the narratives that bind us to places and teach us lessons from the past. When it will happen: During the summer of 2013 we will assemble as a small group in the forest and rural communities of Utah to begin the conversation. This event will take place July 29-August 10, 2013 and will include workshops, seminars, and site visits. During these two weeks individuals will meet to define the parameters of the project. Expertise and knowledge will be shared. A solid plan for continued collaboration will be fleshed out.